The Paul Jungnickel home is a welfare organisation with over 140 residents which are physically and mentally impaired. 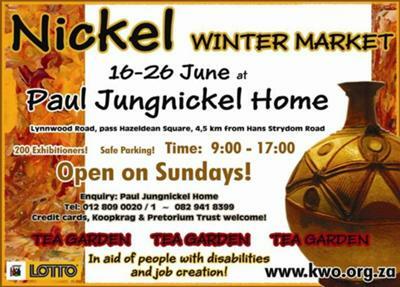 The home will be having their winter market from the 16 to the 26 June 2010, with over 200 exibitioners. Gates open 9:00 am and close at 5:00 pm everyday including public holidays.